The soft, sensuous feel of hand-crafted silk sheets is surely one of life’s most luxurious little pleasures and these exquisitely comfortable silk sheets are among the best that money can buy. They are made from 100% Chinese long strand Mulberry Silk generally considered to be the pinnacle of silk quality. These luxury Mulberry Silk, Charmeuse sheets, pillow covers and duvet covers are made of the finest selection of naturally dyed chemical free silk. Kumi Kookoon, one of the finest makers of silk bedding takes great pride in using only grade "A" raw mulberry silk. Take pleasure in the soft and delicate caress of silk. 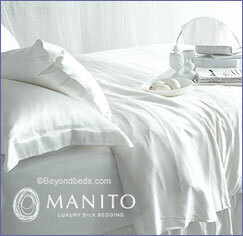 Woven on full-width looms, these silk sheets are seamless and sand-washed for a silky-soft feel. They are as light as a feather and as soft as a gentle morning breeze, while retaining silk's movement, flow and luxurious luster. Pamper yourself with pure 100% seamless Habotai silk sheets. 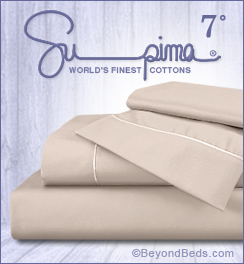 Woven on full width looms, these sand washed silk sheet sets are naturally hypo-allergenic, an ideal alternative for those who are sensitive to other bedding materials. Silk has the wonderful properties of movement, flow and luxurious sheen. 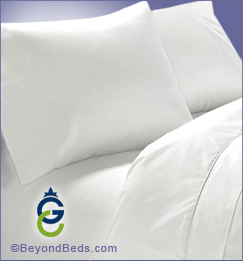 They are so light you will feel as if you are wrapped in a soft, pillowy cloud. Bamboo fabric has been praised as "the natural, green, sustainable textile material". 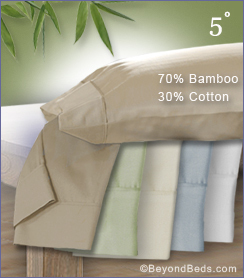 Bamboo fabric contains millions of gaps and holes at the microscopic level, giving it a highly comfortable porosity. 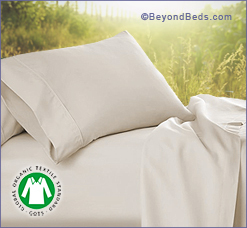 In other words, bamboo sheets do a superb job of breathing, ventilating, and wicking away moisture. 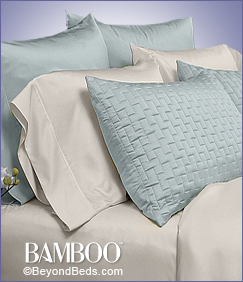 In fact, bamboo is even better than cotton in this area - it can actually wick away water 3 to 4 times better! The result: you stay up to 2 to 3 degrees cooler. 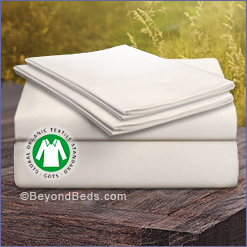 These silky-soft bed linens made from natural bamboo fiber are cool, breathable, luxurious and considered one of the newer environmentally friendly products to offer benefits to consumers. 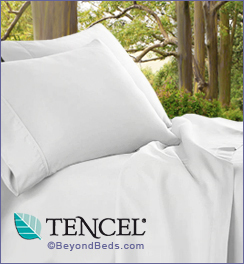 Highly absorbent and breathable, Bamboo fabrics contain natural anti-bacterial agents that make them an excellent choice for sheets, pillowcases, blankets, and any product that comes in direct contact with human skin. Fits Mattress Between 12"- 18" in depth. What do you get when you combine meticulous Italian craftsmanship with the sensual, substantial feel and unsurpassed durability of 100% long-staple Egyptian cotton probably the most luxurious and impeccably styled sheeting you will ever own! Made in Italy by Errebicasa for those who demand the very high quality of true Italian craftsmanship. 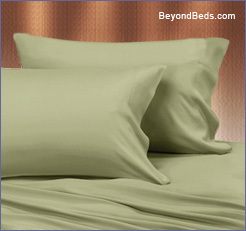 Long Staple Egyptian Cotton Sheet Sets: 600, 1000, 1200, 1500 Thread Count. 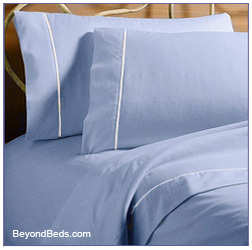 These luxurious, Egyptian cotton sheets will have you yearning for your bed. 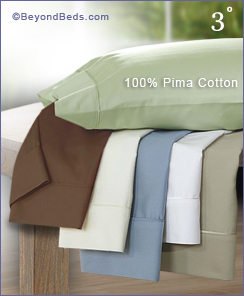 Hand picked 100% long-staple Egyptian cotton is renowned throughout the world for it's softness and durability. 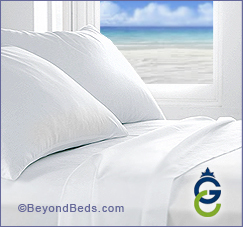 Egyptian cotton's ability to absorb liquids gives sheets made of 100% long-staple Egyptian cotton deeper, brighter colors. (1) fitted base, for easy laundering. 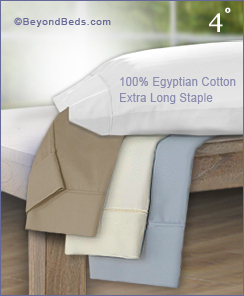 These 400 Thread Count Egyptian Cotton Sateen Single-Ply Sheets from Leggett & Platt are not only made from deluxe long staple Egyptian cotton for extraordinary comfort and durability – they also feature an ingenious "RestAssured™" pocket to help them stay in place on any adjustable bed mattress, up to 18" deep! 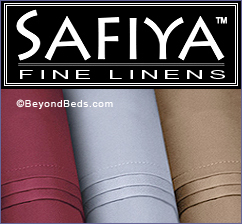 These 310 thread count 100% cotton sateen sheets are simple yet elegant are are available in a wide range of hard-to-find sizes. The fitted bottom sheet corner seams are reinforced for extra strength and have elastic sewn completely around to accommodate mattresses up to 18" thick. 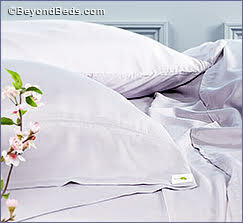 The flat sheet and pillowcases are trimmed with an elegant white satin piping.